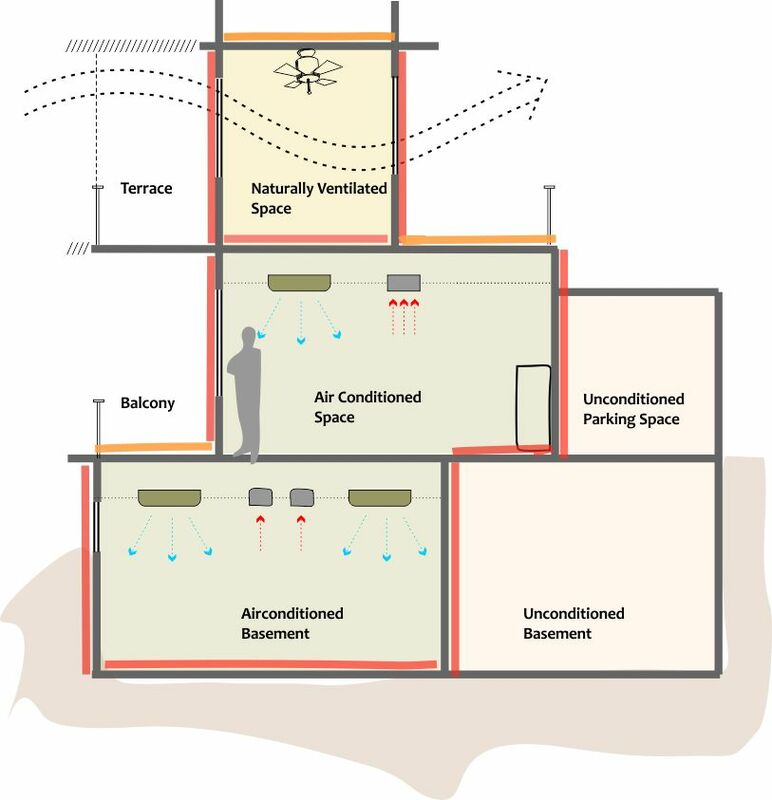 The figure above shows insulation position for air-conditioned and naturally ventilated spaces in a building in warm climate. Insulation should always be placed on the warmer side of the envelope. In warm climates, insulation should be installed on the outside and in cold climates, on the inside. Thermal insulation in walls and roofs reduces heat transfer between the inside and outside and helps maintain comfortable indoor temperature. It provides healthier environment, adds sound control, and most important lowers the electricity bills. Insulation helps keep indoor space cooler in summer months and warm during winters. There are variety of materials to choose from including fibre glass, mineral wool, rock wool, expanded or extruded polystyrene, cellulose, urethane or phenolic foam boards and cotton. They are generally in the form of amorphous wool or rigid sheets, or require in‐situ pouring. Insulation is rated in terms of R‐value. 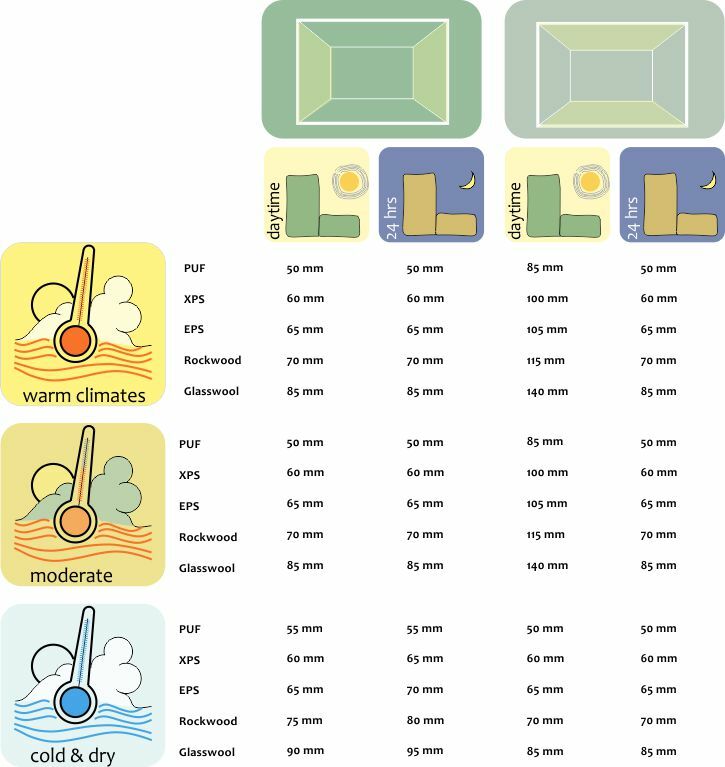 Higher R‐values denote better insulation and translate into more energy savings, much needed to meet NZEB design goals. Insulation should be placed at the hotter side of the surface (in case of summer cooling, insulation should be on outer side, while in case of heating the building, insulation should be placed on the internal side). Insulation material should be chosen keeping in mind the following parameters – thermal performance, lifetime performance, fire safety, moisture and condensation, air infiltration and environmental benefits. Insulation can have a disadvantage that it can prevent the building from cooling at night. Insulation should be always used with a heat storing material, this storage mass should be placed inside a passively cooled building. In passive heating or cooling buildings, thermal insulation should be used taking into account the problem of condensation. When damp proof materials are used, they should always be on the warm side of the insulation. Use of insulation is more effective in hot climates where demand for cooling is very high. During summer months in hot climates, thermal insulation must be combined with an effective ventilation strategy at night (when it is cooler) to flush out the heat. It is recommended for architects to check with air-conditioning system designers to explore the savings provided by an insulated wall. Providing insulation beyond 100mm thickness does not provide a much further benefit in terms of energy efficiency. Provision of the initial 25mm of insulation, provides the highest incremental energy saving. As the insulation material becomes incrementally thicker, the incremental energy saved becomes smaller and smaller until it is almost insignificant, especially after an insulation thickness of 100mm onwards. Minimum insulation values and thickness recommended by Energy Conservation Building Code for slabs and walls in daytime and 24 x 7 occupied buildings. “Energy Efficient Buildings in India “- TERI. Sustainable Buildings – Design Manual – Volume 2. Insulation reduces the heat ingress or heat loss through the walls and roofs. This results in better radiant temperatures and higher comfort in the adjoining spaces. Insulating the roof and walls of a building could reduce the heating or cooling loads by 5-8% and could lead upto 10% reduction in annual heating or cooling energy use. These savings are averaged for typical commercial buildings, and even higher savings can result in buildings with lower temperature setpoints and longer hours of air-conditioning.